When it comes to the sexual behavior of Tasmanian bryophytes, there are no lack of interesting species with juicy stories. One such moss is Rhacocarpus purpurascens. 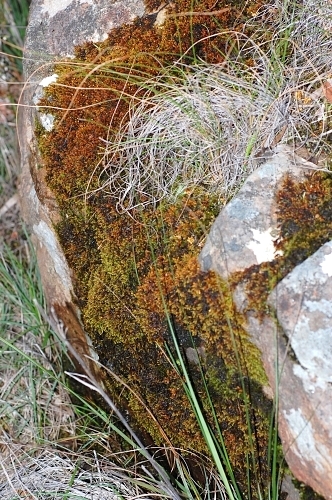 This is a moss that typically grows on rocks in alpine regions and can frequently be seen submerged in alpine tarns. I never fail to look out for it everytime I visit such areas. Oddly however, R. purpurascens it also occurs on large boulders at much lower altitudes near to sea level (see my previous post on my Cataract Gorge visit). Not a great deal of native plants can claim to have such a wide ecological range. 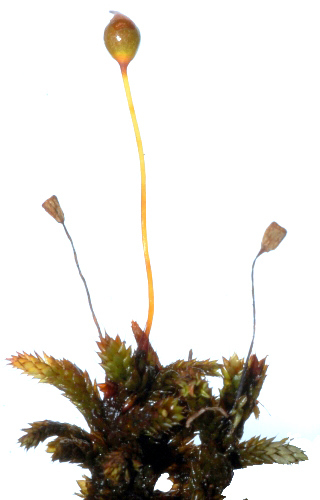 R. purpurascens is a very distinctive moss once known. The leaves have very fine hairpoint tips are arranged spirally around the stem in a very regular and neat fashion, conferring to the shoots a beautiful braided effect. Also, the brighter hues of the new shoot growth often contrasts beautifully with the older and darker parts of the plant. I dedicate this post to R. purpurascens because this is the first time I am seeing it in fruit. Since 2006 I have been looking out for capsules on this moss, particularly everytime I got to visit alpine areas. Interestingly, Paddy Dalton, a leading bryophyte specialist in Tasmania, has never seen R. purpurascens capsules up in the alpine areas in all his years of bryologizing. Oddly, he has observed it fruiting in Cataract Gorge, a lowland area. Paddy has written about this in the 35th Volume of the Bryological Newletter. 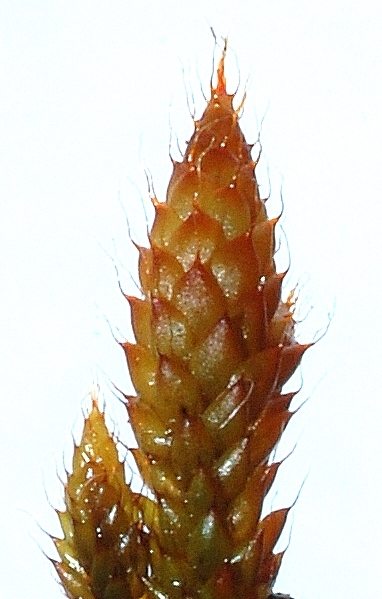 The elegant capsules are vase shaped and borne on a fine stalk (in bryological terms refered to as a seta). I found fruiting R. purpurascens in the most unexpected of places – at Knocklofty Reserve. It was growing off a chunk frequently soaked exposed dolerite on the top of a cliff face. Not only was it fruiting, there were dried capsules indicating that it must have been fruiting in at least the year prior as well. My conclusions about this interesting disparity in fruiting behavior mirrors what Paddy wrote in his article, that phenological (study of flowering/fruiting behavior) investigations will be necessary to find out what is going on with the populations up the mountains. Perhaps what we are seeing is a very versatile moss that chooses procreation when the conditions serves it but opts for celibacy instead under the harsher, colder environments on the tops of mountains. In the latter case, it has somehow managed to reproduce itself asexually and has been very successful at doing so. Whether sexual or celibate, alpine or lowland dweling, R purpurascens has been hugely successful. This entry was posted in Botany, Bryophytes, Key Characters and tagged asexual reproduction, moss capsules, Rhacocarpaceae, Rhacocarpus, Rhacocarpus purpurascens, rock mosses, rock-dwelling mosses, sexal reproducation. Bookmark the permalink.